Odlewnia Żeliwa Simiński-Ordon Sp. z o.o. S.k.Core shop - Odlewnia Żeliwa Simiński-Ordon Sp. z o.o. S.k. 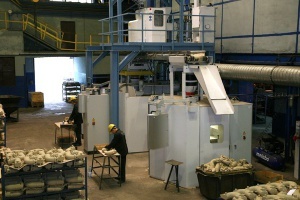 As a part of the machine park in the Simiński-Ordon Cast Iron Foundry is also modern Core shop. As a result, we are able to offer the customer a broader spectrum of products. Manufacture of the core is made in the technology of amino – cold-box. For this purpose we are equipped with core shooters Laempe LL20 (produced in 2008 and 2014).